Tall Tree Cycles Ride Log: Magical. Untamed. Africa. This Friday, Tall Tree Cycles' resident time trial master, David Stachon, will fly to South Africa to prepare for a the AMSA Cape Epic stage race. The race, which begins on March 27th, is composed of 8 stages, launching from 27km in Tokai Forest, which forms part of the Table Mountain National Park. Dave, like all other competitors, will race with a partner, a friend I believe lives in South Africa. Dave has been training as hard as he can on top of working full time and family duties; I'm confident that he will be ride well and have a great race. I'll be receiving email updates from the organizers daily on Dave's progress, which I will share here. We'll be able to send Dave our encouragement through this portal; whether he has energy to do anything more than change and eat before hitting the sack each night remains to be seen. Here's an exciting Trek video about the race. Dudes are fast. I'm pretty certain Dave and his partner will race the Masters category, so I don't think they'll be 'worrying' much about these two. wicked single track amazing scenery. Good times. Yah gotta do La Ruta at least once though. That has to be the toughest due to all the micro-climates. 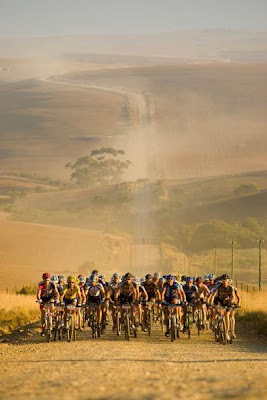 La Ruta is only 4 days and it's biggest day is only 700m bigger than the biggest in the Cape Epic. I wouldn't call that flat. That's a pretty incredible opportunity you've got there. Good luck, Dave! I like how they mixed up rest heart rate and max heart rate on the little stats charts of the fast dudes. whoa! ...so cool to be blogged about. haha ...cape epic is "supposed to be flat" some good old fashioned trolling I reckon. All the best, Dave. Looks like it'll be a wicked exciting race! @Pascii: Yes, I noticed the mix-up. But it made me think, who cares about max/rest heart rates? I'd much rather know what these guys' lactate threshold power is, or at least their VO2max! Best wishes Dave - go gettem !